DetectingScotland.com - Metal Detecting in Scotland, UK » Forum » Detecting Abroad » Detecting Finds » ID please. Posting this up for paisleymuddy he found it in the bottom field at DS dig today. It's copper thinking billon there's not a lot of detail so it's a wee teaser I guess. Oh it 20 MM. in diameter. Think there was another today? Not got a clue mate, but well done on a nice find. Can't help on this one but it looks very interesting. Well found paisleymuddy. Intriguing wee find! Looks like it's based on an escudo... Very nice! ...saw this in the field today and thought it would be a tricky one. Possibly a French copper hammered or forgery? 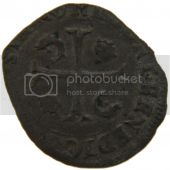 It looks like the shield of France on the obverse and a long cross with crowns in the angles on the reverse? 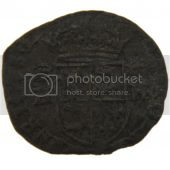 Could it be a jetton, or maybe that is the same as a token? Looking in my Gordon Bailey book there are jettons similar although the obverse side with the shield is not shown in the book. Davy that looks very like it think we will go with that now all I need to do is ask wullie which hedge he wants me to chuck it into lol.